Hey Mr(s) hard charging, failure is not an option, damn the torpedoes, hit the beach and burn the boats, go for broke business manager....what happened? American companies used to push the envelope. Leaders and managers contributed to a vibrant environment of exciting progress and growth. Then we created "empowered" companies and the exciting growth seemed to slow - in fact in many cases now frustrated "quasi-empowered" folks leave stagnant companies to create the vibrant growth environment in new companies - abandoning their employers for the verdant distant pastures on the horizon. So today, most B2B manufacturing companies wallow in their bewilderment aboutnew market conditions. The old approaches don't quite work, but they're not so completely dysfunctional that it's obvious for all to see. So companies tweak a little here and right size a little there, without fundamentally adapting their B2B business development approach. There was another 'side' to the frontier push. Danger and risk. And the preferred tactic when the fur started to fly was to literally circle the wagons creating a 360 degree defensible perimeter. Somehow along the way, the bold push of the frontier spirit, balanced with a bit of defense, became inverted. Now it's defend in place, with an occasional flash of spirit. The result? Ineffective business development characterized by disregard of rapidly growing global markets and doubling down on bland B2B marketing crap. "The question is no longer if. The real question is when. The when-not-if paradox is not exclusive to the mid-’90s Internet rush. It’s been a dilemma for centuries, and continues to grow in magnitude and importance. Mobile devices: when, not if. Social media: when, not if. Adapting to a millennial workforce: when, not if. Expanding into global markets: when, not if. And that's the problem. Most B2B manufacturing companies are asking yesterday's questions. "How can we be a bit more efficient with our cold calling?" or "Which magazine ad will get the most impressions?" or even "Why is XXXX company trying to export? That's just for big companies." The ability to intuit and ask insightful questions is what distinguishes great leaders and consultants from the mediocre mass. But today's markets are particularly unforgiving of mediocrity. It's time to start asking the right questions....to put your B2B business development on a sustainable and profitable path. Are you bold enough to do so? 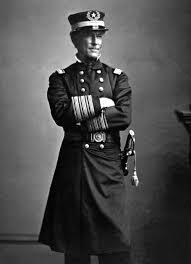 Maybe it's time to channel your Admiral Farragut - to "damn the torpedoes" and call for full speed ahead!